INAUGURATION A collection of antique huipils, women’s and men’s tzutes (made of cotton, silk and ixcaco) from Chichicastenango and environs. 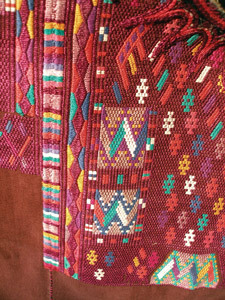 On opening day there will be a demonstrating of weaving techniques and an explanation of designs by a weaver from Chichicastenango. Typical beverages will also be served. (More info: agremialdeartesanos@gmail.com) Through May 31.